SafeAuto Invades Nashville for "Do The Jingle"
Nashville is home to the country music hall of fame and famous musicians such as Johnny Cash, Jimi Hendrix, Carrie Underwood and Taylor Swift. When it came time for SafeAuto to pick a city to visit for their annual “Do The Jingle” Contest, Music City was an easy choice for the leader in affordable car insurance. SafeAuto’s camera crew will be in Nashville, Tennessee on October 26th-27th filming talented musicians. Each artist performs a 30-60 second rendition of the 1-800-SAFEATUO jingle, which is eventually entered into SafeAuto’s national “Do The Jingle” contest. The winner will receive $5,000 plus a featured role in a SafeAuto Insurance commercial! In addition to SafeAuto’s camera crew filming musicians in six different cities, video uploading recently kicked off. Artists can submit their clever rendition of the SafeAuto jingle by uploading their video online until December 15th. Whether or not the winner of the upcoming “Do The Jingle” contest will come from Nashville is yet to be determined. If the winner happens to come from Music City, they will certainly be etched into SafeAuto’s “Do The Jingle” hall of fame! 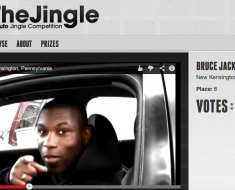 Video Animation Whiz Gives ‘Do The Jingle’ Contest a Crack!